This game is fun but I wish that the money system was lower or reasonable and that everything didn’t cost any money and there should also be a option to skip the computer instead of waiting for them to finish up their turn but other then all of that the game is really really fun I can spend a long time on it sometimes. Game is very fun. Just like the board game in real life. Only thing I don’t like is that u have to pay and on top of that, it’s $4. That’s insane. I might as well just buy the board game. I play this every night with my daughter! She loves this it is fun and enjoyable! I really enjoy playing this game. 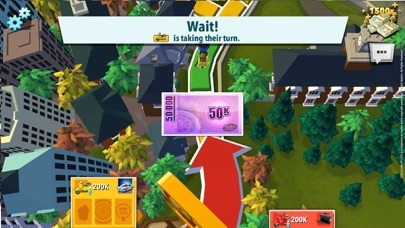 I would like to have access to the extra vehicle and player icons without having to pay for them seeing as how I already paid to have the game. They should also add a feature where you can invite specific players to an online game like they do for clue and battleship. If you create an online game you get a game code that you can send to your friends so that they can play with you. But on Life you have to sign in with Facebook for that option which is lame. Not everyone uses Facebook. Overall the play of the game is fun though. I am really upset with the people that gave this app bad reviews! This literally looks like it was made in the early 2000’s. The graphics are so much worse than it used to be, not to mention the overall game used to be so much more fun. The new version is the worst one, and I am not satisfied with it at all. This game is so much fun. It’s entertaining and is exciting. 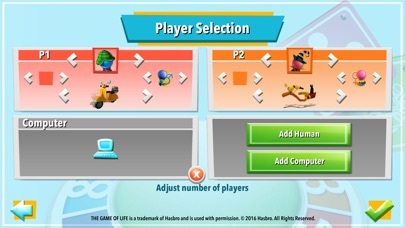 You can play with up to 4 people and if you want you can add computers to play with you to extend the game. Love this! I really liked the old game the new version is just a lot different and you shouldn’t have to pay when it is worse than the old free game. Somehow my games language has been changed and I can’t figure out how to turn it back. Irritating! Oh good lord, what have they done to the game??? This is *awful*. I got it as part of a bundle, and deleted it after playing once. The constant mini games and “everybody spin something something cupcakes!! !” drove me bonkers. Terrible. Don’t bother. So much worse than the actual board game was! Granted, maybe the actual board game is crap now, I don’t know. But it can’t be as bad as this, because at least there are no mini games! I actually like this game.. I think $7.99 per season buy is a bit much .. but even that does not bother me as much as bugs in the game . If you are playing off line it’s usually a smooth game, but online game feature keeps crushing , or being frozen , or suddenly “lost connection to the internet”.. however after restarting of the game it suddenly finds that connection, but game you were playing was not saved .. and you need to start from the beginning with different people .. it happens in 3-4 games out of 5 .. Excellent family fun game, almost exactly like the board game. I've never been able to finish an online game. I'm always seeing waiting dialogue lasting around 5 seconds at a time. A great game worth the price. Love this game. Lots of fun. I don’t like it and I’m upset I paid for this game. It’s the first one I’ve paid for and I regret it. I really wish I could get my money back. This is the best game in the world. Love this game. Super fun! This game is not as similar as the original game board. Plus this app costs WAY to much just for that. Plus you must pay extra for more features. For example, the world selections. Just the summer beach party selection costs $3.99. But the game is fun to play but, it still costs WAY to much. I hope that if you do buy this app that it is what you hoped for. I loved playing this game even though it’s my first time I still love it. I like that your car moves the number of spaces you spun.You don’t have to drag your car that number or anything like that and I think that’s cool. I have no complaints except that it doesn’t show how much money you have so far when it’s cashing in everything, it just says ???k. But that’s not a big problem because it shows you how much money you have in all at the end of the game. 5 stars! I really enjoy the game I was dying to get the game and I got it I am dying to by the board game now! I wish i could give the game 5 stars because the game of life is my FAVORITE board game. however it’s pretty upsetting how you have to buy everything. I had the original game on my ipod touch years ago and it was close to the original board game. I paid my $1.99 or however much it was then and that was it. now you have to buy everything. you have one car to chose from and you have to buy other boards. People with first version, beware. If you use to have the first version of this game years ago and loved the game as much as I and many others... you will HATE this game. Everything, EVERYTHING changed. It’s not even like the board game whatsoever. Sad excuse for Life. This is nothing like the original, they updated it and made it like the ‘new’ version of life and it’s trash. No life tiles, you don’t have to buy a house etc. You just have to spin constantly. That’s it. It’s boring. All the yellow spaces just make you have a spin-off with another player. And that’s like every space. This should be like the original, not some bull where all you do is spin. DO NOT waste your money. Upset, disappointed, and angry. I want my money back, I will never play this trash again. This is a fun game, and has good potential. But almost EVERY time I play, the connection gets lost and I get kicked out of the game. It’s really annoying and irritating, especially since this game costed money to even download. Needs fixed up a lot, but I won’t be playing anymore regardless. I like the new version of Life. Very animated and colorful. I like the the changes like playing games. The only thing I would complain about is it runs a little too fast. So hope everyone is a speed reader or plays the game a dozen times to learn it. But I enjoy playing. This game is GREAT! But I have some cons like how it takes forever to turn in your action cards, and how it’s so hard to spin on I phone. Maybe it’s because I have a I phone 6 S ☹️. Also you can’t invite your friends in message or in Instagram because I don’t have Facebook but I have Instagram and message like everyone. But this game is really great. If you are ever needing to pack games or even but them at target think about how much space they take up. Instead of being able to bring ten games you are only able to bring four. Well with life, monopoly, clue, battle ship, you can take them all. Also I bet you could buy all of these games for around the same price of a normal board game! Really? Just get the clue life and battle ships game for ten dollars! Very unhappy with this game. First my kids come to me and ask me if I want to marry a boy or a girl. I guess somehow that is excepted now. Then I spent the rest of about 10 minutes trying to figure out what was going on with the game. What happen to the game of life. Whatever this is isn’t it. My 10 year old girl tells me daddy girls don’t marry girls. I guess she’s old school at 10. The game is really fun. Passes the time when your waiting in line for something. I am only nine, so I love the board game of Life. but, the iPad version of the game is waaaaaaaaay more fun!!!!! 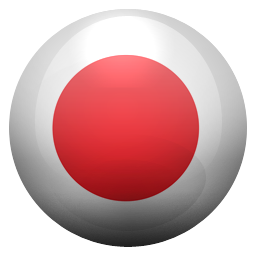 !This is my favorite app and I have like 50+ other apps!!!!! How do you screw up a classic? I had the original version for many years and loved it. How the heck do you screw up a game like this so badly? It’s horrible! Crowded board, the life events aren’t nearly as relevant, you don’t even get raises as time goes on? And mini games are unnecessary. You constantly have to tell the device to speed up computer players, don’t have any dangers of losing Life cards (since they don’t exist). Too many changes. This version plays more like Candy Land than Life. Extremely disappointed. This game of life is way better than the board game so many different versions than just the original board game and no tiny pieces to pick up! I love the game of life but I wish that all of the extra game boards and accessories came with the game for free, there isn’t a lot of options to choose from unless you buy the extra purchases within the game. This app is truly amazing. Whenever I have a substitute teacher, my friends and I get together and play this game on my phone. It truly makes us laugh and enjoy our time and we love to make fun of each other for things we can’t control in the game. My only complaint is that it takes up SO much of my battery. I’ve played apps non stop and the most my battery runs is about 20%. This app seems to consume almost 50-60% in just an hour. I wish you could see if it’s the way the game is built or not because I truly don’t believe it’s my phone since it’s relatively new. This game is amazing. 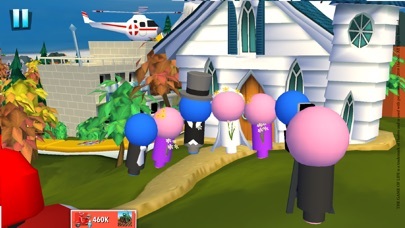 It is really fun and they add on all of these fun things like you actually see them get married or you see the graduate. Also when you get a baby you actually go in the hospital then one second later you come out with a baby. If you are thinking”wow I don’t want to spend money on this game” I think you should. You won’t regret it I promise! This game is awesome 😎 cool 😎!,!, ,!,,!!!!!!!!!!!,,! I have this app on my iPad from 2012 and it’s super fun to sit and play with the family. Downloaded it on my phone and the updated version isn’t nearly as fun or appealing to play. I bought the game for my kids to play in the car for long car trips. Yes, you have to pay for many extras but you don’t need them. The kids and I had a blast playing the game. Everything is good but please fix the error when inviting friends on Facebook it disconnects every time in each game . If I knew how short it was I wouldn’t have bought it. I had been debating on whether to pay for this app or not, and I’m glad I did. I really like this game however I wish there was a feature where you could turn off the mini games. They really start to get annoying. So I have played the board game for months and the app of the games is even better cause now you can play online with other people and now you are able to show your felling to everyone in the game. I LOVE THE GAME🏵🏵❤️❤️❤️❤️❤️❤️❤️❤️❤️❤️❤️❤️❤️. Hope this was helpful! I won to my first game! I wish there was more free content. That’s the only thing wrong with the game. Season Pass didn’t include all dlc. Great game but season pass didn’t include all dlc. So bummed out. It was a really fun game! I loved playing it and I am going to play it more in the future!!! 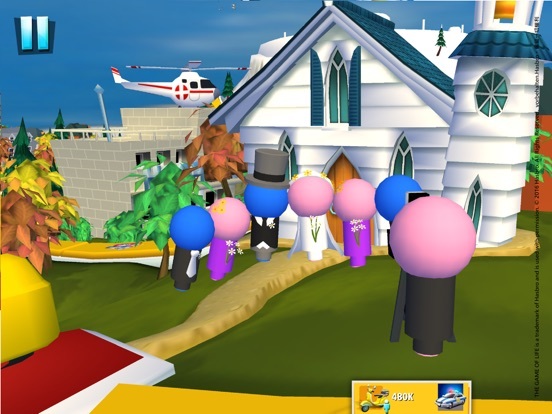 I love this game so much but one time this game was took down.When I had this game I was 7 I think (There is not much of a age difference I am 11) then I delete it for a random reason.I was 9 and I wanted it again but it was took down.Now I am 10(My birthday is five days away) and it’s back?? ?Someone if you know the reason plz tell me.Have a nice day!!! This game is so awesome! I can play with the computer! The Board Game was fun! I thought I was losing to the computer the first time. But I didn’t like when it doesn’t regencies my swipe to spin the wheel. I like the new version, but the older version was WAY better tho. The game comes to a rather abrupt end on the free board. You go from collecting babies to the risky/safe path and then suddenly you’re in retirement within two or three spins. Old board games and online versions used to draw this portion out and from my estimate, your life isn’t over that fast! I’m fond of being able to own more than one house or forgoing a house entirely. Otherwise the mini games give the mobile version a nice twist on the game. It’s a little hard to justify a season pass with so much locked up behind a paywall. I need more to convince me the game is worth it. I don’t feel like I got my money’s worth of what I did pay. If the old fashioned game isn’t the length I remember it to be, then what good is that? It makes me unwilling to pay for more. Needs more content for the free version to make me willing and eager for more. Simply passing and barely so. A mediocre incarnation of your favorite game. I just love love love this game. I thought about playing it today. This is really one of my favorite games. One day I went on App Store and saw this game a got it. I am actually really really glad I went on App Store to get this. I play this game on my iPad and glad I got my iPad for Christmas. I really think this is a brilliant game! Who ever made up and thought of this game thank you! I am glad we had games and iPads to play on! I am so thankful and blessed for these kind of stuff! I am really really happy and amazed that someone was smart to make up this game! There is a few things I don’t really get or like but I am still thankful and blessed to have this game and at least a game like this game. I am super glad to play this game and I was so excited for this game! MAN I don’t know how happy I could not say it. Thank you for making this fun fun game! I miss having my character look like humans do. The game updated to pegs to “be more like the current board game”, but I would rather personalize a person than a peg. Also, being a female, I noticed that the computers only play as male. It’s alright until you play 100x over and it never changes. The new version has some okay-ish mini games. However, the #1 thing I miss from the old version was feeling like I actually loved the game. I feel like this is almost Mario party with rewards and mini games. I miss the steps of choosing a house and going down a risky road and possibly loosing it. Or having (like another reviewer suggested) the risky road have accidental children instead of always just taking 100k. I miss the album at the end making me feel like my life just ended. I want my character to age, not some peg to drive multiple vehicles and then retire. All in all... I prefer the old version, but will continue to play this because I have nothing better to do. I read a review entitled “Nothing is good anymore” and had the heartiest laugh . . . Complaints like “players get paid too much,” “the money system is different,” “I can’t choose the vehicle I drive around in” and to sum it up, “I never thought something like this would happen to mobile gaming.” Seriously?!? Ha ha ha!! Oh, first-world problems. 😂😂 Why is it a bad thing that people get paid more? EVERYONE is getting paid more. Who cares if the money system is different, it’s fun and it works, and does it truly matter which vehicle you drive around in?!? That’s the LEAST of my concerns. Wow. ANYWAY, MY REVIEW: It’s a fun game, I don’t own the board version, and figure the board version would be boring in comparison. There’s not a single feature that you NEED that you have to pay for, so zero complaints. It’s just pure fun. I like this version of life but I liked the old one better it’s just in the old version there weren’t pegs they looked more like humans and I don’t usually like the pegs because if you’re a girl like me wouldn’t you want to be a different color then pink!! I mean I like the color yellow and you need to be the color pink! You know girls can like blue and boys can like pink right?? Well anyway every time I play with computers the computers are always male. why? Can’t you guys switch it up a little!? And my last thing is why is every theme 3$ I mean why isn’t it 1$ this is coming from someone that has a hole bunch a money but still why does it need to be 3 bucks it should definitely be 1$ I mean let me get this straight: I think all the themes aren’t that cool and you just play the game with a theme I mean it’s like not that cool. It doesn’t deserve to be 3 hole bucks!! I guess that’s just my opinion. It’s not a bad game though 👍👍🙂. I got a new phone a while back and lost the game from my phone. It wasn't until a few days ago where I remembered about the game and re-downloaded it only to find its completely different. Change isn't always a bad thing, but in this case, it is... first of all, there's countless different features and additions to this version which is great.. if you didn't have to pay for every single one of them. Second, this version is rid completely of the classic game of life everyone knows and loves unlike the old version which reminded me just of the real game and brought back countless childhood memories. This new version is nowhere near as much fun as the real game like the old one was. I also find the game play kind of "busy" and confusing if that makes sense. I won't pay for different worlds to play in, but I would pay the classic version if I could. Some way to play that game again would be amazing. Game is fun, but very unstable. Needs work. I just purchased this game, and while playing over local WiFi with my girlfriend, we were forced to restart the entire game twice, after having downloaded the game only 30 minutes prior. We’re pretty upset, as we spent good money to play the game, and bought it in a pack with two more games from the developer, Clue and Battleship (Clue works well so far). I’m hoping the developer can either keep up with current iOS devices in the form of regular updates, or take the app down as to not lead honest consumers astray with a product that has a major design flaw. Playing a game for twenty minutes, only to have it crash and lose all your progress, is very frustrating. I’ll gladly change my review if the developer can craft up a fix for this, or the ability to save a game. Love additions! More ideas for enhancements! I love the new scenes, vehicles, and the fact that you can be gay. I like that the cards for getting others to pay your debt and such have gone away, and the new bonus system is better, but still has nothing whatever to do with the game of life. I wish the spins would give optional selects instead of random bonuses, like buying a house does. That way, it would create more of a story. Also, marriage should be optional, just like kids (but maybe add an "accident" option). Also, there should be a divorce option (maybe a split road, like a midlife crisis). Houses and jobs should match the scene we're playing. All in all, excellent upgrade, and worth spending to get it again!!! Many subgames and graphics are great. I’ve read some of the negative complaints on here and I’m not quite sure what they’re complaining about. In the board game you got one style of car and a little plastic peg. In this game you get a scooter you start out on and it evolves into a station wagon, same concept. As to the children, the little peg people get out of the car and go get their babies in the hospital, in the game if you landed on babies you added a little peg to your plastic car. Yes there are additions you can add to the game, but it doesn’t hamper game play if you don’t add them. There are many subgames that you can play and they don’t cost extra. I was super excited to play this game. Happily paid for the app, which I never do, and downloaded. Only to discover absolutely EVERYTHING is an extra fee once you get into the game. And the fees aren’t cheap. They’re more than you paid for the actual game. Very disappointing to realize you got basically nothing for your money. The game is fun enough, but the features are very limited unless you’re willing to cough up more and more money. There is no way to earn money to buy extra features within the game or level up in any way. It’s just the game, and you pay actual money for any extras you want. Also, there are serious connection issues regardless of how good your internet is. I’ve been kicked out of multiple games where I was winning because the game had connection issues. It’s just disappointing all around. The game is overall enjoyable but already having to pay $2.99 to play the game- we shouldn’t have to pay an additional $4 just to get different cars and appearances. Also I strongly dislike how you have to land on a space in order to buy a house. That should be one of the stops along the journey. I played about 15 games or more and I only landed on the house option twice which is quite annoying. Also I always seem to roll high numbers and end up flying though the board and then having to wait for the computer players to catch up. Not very enjoyable. Also, you seem to earn loads of money for not doing much at all. Have never been in debt, yet. Should be more realistic like the board game. This game is not only a blast to play but it’s gorgeous and never has any issues. I had one question that I emailed to Marmalade and I received a response immediately. So I have to add Customer service to all the great things about this game AND another of their games....Clue! Update: I’d like to add a question. My husband and I play this a lot and when it comes to choosing a career after school he chooses whichever job comes with lucky number 5 regardless of the salary. And he wins every single time. 5 pays $130k bonus money each time anyone lands on it. And everyone lands on it ALL THE TIME. It is the most spun number every game. Hopefully fixable? Good game, but not worth the money. The game finishes quickly and there isn’t much incentive to win. I just played through two games in a matter of 15 mins and they weren’t really all that engrossing, to say the least. This game isn’t worth more than $1. The create-a-player needs MAJOR work. I couldn’t even figure out how to get the game started initially because I didn’t understand the create-a-player screen. It could be simplified, like the game could just ask a couple of questions in order to build the player profile and begin playing, instead of it all being jumbled little pictures with no words or directions of any kind. I played this game for FREE just a couple of years ago on my iPad. And it was great, I loved playing this game. YOU RUINED AN AWESOME GAME! It is hard to control, you have to buy everything. Most importantly it is overpriced. I waisted my money on this game. If I could get a refund I would, really disappointed at what this game became. Don’t buy this game. It doesn’t deserve even one star for this review. WHATEVER YOU DO DON’T WAIST YOU MONEY ON THIS GAME. The original was much better. This “new and improved version” is hard to control, not as fun and overpriced. I may be repeating myself but it’s not worth it. Also if you are playing by yourself against a computer the computer plays the whole time and you just have to sit and watch. Please just restore the game to the original, it was much better. Sorry for complaining, but this app isn’t worth buying. I love this app, and I play it with my brother all the time. I just found a couple of little things that could use improvement, and one big thing. First things first, let’s start with the big thing. 1) the biggie is the online playing. Whenever I’m in the lobby, the app crashes. I never got a chance to start an online game because of the glitchy online mode. 2a)little changes are sometimes big. Like buying a house. In the actual game, you had to stop and buy one. Now you have to land on the square. After my brother found out that you get money at the end for your house, he would get upset if he didn’t land on the house square. 2b)life cards. I know instead of life cards, you get action cards. But I still miss that you get the life cards. The life tiles are better than the action cards, and I miss life tiles from the original game I played the other day with my family. 2c) one suggestion I have is being able to skip the CPU’s turn. I tried playing with CPUs, and their turns take forever! Life has been my favorite board and online game my whole life. I own the board game and have played online back when you had to buy it on CD’s for your desktop and have had the app in years past. This new version is absolute trash and a disgrace to the game. The new layout is awful and it needs to go back to what the original is. I want to be an actual person like you could be on the CD and not a peg. It is great you can be gay or straight though. I do not like the action cards and the mini games, I don’t want to play those. I read so many great reviews before purchasing and I have no clue how people enjoyed this app, it is not the game of life that I know, you need to change a lot. I’m just very disappointed because I love this game and this version just made it trash. I loved to play the original game of life app because it was so similar to the actual board game. This app is nowhere near the real board game. You can’t see your own personal details and you play more as a group than as an individual trying to win. Although the digital animation is great and fun to watch, it would be better with the original game. Also, it is all over priced, just to have ANYTHING different you have to pay for it! And I also had the game glitch the first time I played it, and when I went back to the game to continue playing it did not save the game! I wish that this app would keep the same well-loved bored game and then make new ways to play. Don’t spend your money on this game if you expect the same great bored game that we all love! I had only played this once when I downloaded this game. It was at my friends house, and ever since, I was in love with it. Unfortunately, my friends never wanted to play when I was over there, making it hard to play, as in I played it once and that was it. I don’t know what it is, but I just love the idea of the game. So, I decided to see if they had it in the App Store. They did and I immediately downloaded it. 3.99 dollars is such a reasonable price for such and amazing game. It is such good quality, and I will NEVER get tired of playing it! I am a big fan of a real “game of life” (I have about 3 versions in real life), so this game is awesome. 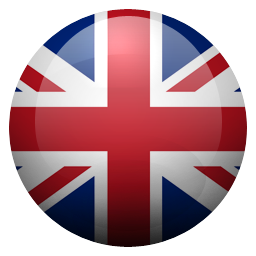 If you are going on a trip and can’t take the real game with you, then this app is the best thing ever! I am not sure if you can play it without WiFi but this game is definitely worth $3! 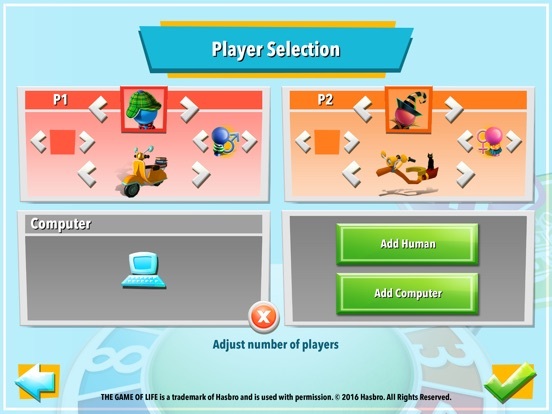 You can play with your friends, other players online and even with computers. 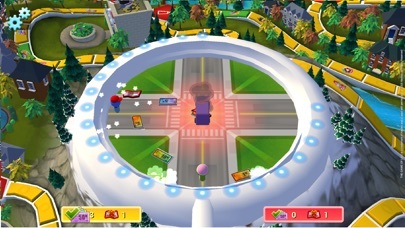 You can play with up to 4 people (including you) like in real game! 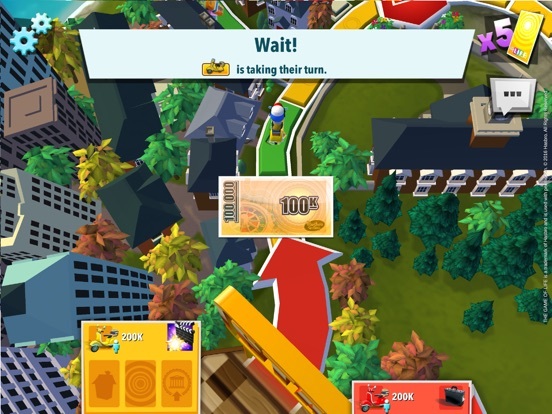 The only problem of this game is that you cannot touch the money, or spin the wheel like in real life. TOTALLY LOVE IT!!! Fun, and great with friends and family!! I had a lot of fun playing this game. I just downloaded it and it is a very enjoyable game. I played alone so it was a little more on the boring side. But I’m sure if you play with your friends and family, you’ll have a even better time!! The 3d models are awesome, and I love the action cards. In the end, I think you should buy this game. Or, you can buy the REAL board game, you decide. This would have been 5 stars if you made it so you can add usernames, and such. So you can identify each other. Anyway I love this game, and I hope others do as well!! This game is so cool. 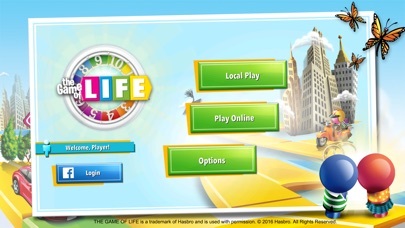 I wanted the real board game but I couldn’t have it, so I was looking on the intranet on mobile versions for the game of life, and I found this game and I thought to myself, this would be a really fun game. Then I started playing it and, it was so much FUN! Whenever i’m bored I play this, so it prevents me from eternal boredom. So I would really recommend this game, to those of you that can’t have the real board game, so then you could just play on the mobile version. Thank you for reading this review, bye! 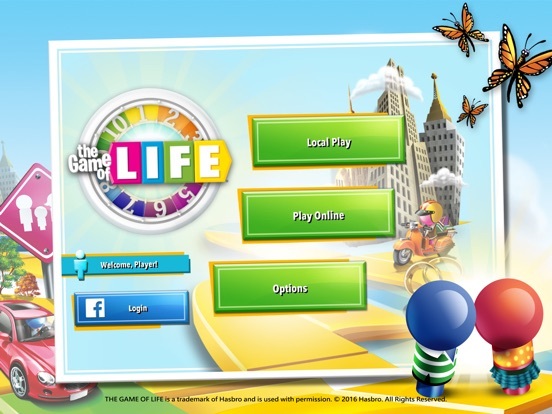 I’ve always love the game of life and I used to have the old app as well as the board game. Unfortunately this game has so many technical issues. For example, whenever me and the two computers in local mode spin to see who goes first I always go last even when my spins are higher than one or two of the computer players. Also, sometimes, the computers randomly get to spin and move twice without having a stop sign. In addition, I was disappointed to find out that you have to buy so much in app despite paying for the app in the first place. Just played a game. Newer version. I don’t care for the mini games and very hard to play. Then the game already cost money but to get better things you need to spend at least 20 more bucks. So it’s all about making the money. During the game all players when I landed on their number while spinning got so much more money even though my job was the second highest in the game. There are a lot of things that need fixed. In the normal game of life if you land on the persons number you pay a flat fee of 40 or 50k but this game is different and all my players somehow were higher than mine? Also most of the action cards are the same. I love this game but I rate it four stars because it sometimes shuts of the volume when I close the game. I played a game and got second place which is not a bad thing but some guy who was in third place feels bad for himself. He only had $3170 and we had even more than him. He also started bad in the beginning but when I had my first unfinished game, I started out bad and catched up. It’s like the same as Monopoly Slots (which I hadn’t downloaded yet) but with no gambling. I hope you all listeners like my story. Bye everyone. While I do enjoy the app, I believe there are way too many in app purchases. You already pay for the game, and then they try to charge you for everything else (like different versions/themes, icons, cars, etc.). I just think it’s a bit ridiculous and annoying. Maybe come up with a way to gain points in game, which you can use towards those extra purchase? And then maybe have an option to pay for more coins? I just find it very annoying when games you have to pay for have a million in app purchases. I want so badly to love this game. Mostly because it is the only life game on the market but also because I am a life game fanatic. I love all versions of life the game... but this. I loved the old version for about 6 months it was the only game I would play. I would keep saves, constantly look through old games and stay up late for hours to play. The characters in the game would actually have a connection to me and it would be sad when a game ended. Now I can’t even finish a game, I mean if you love the game to each their own but I loved the 1.0 version and it very much feels like it’s trying to be other games and not the original life board game and Hasbro Version. Its a fun game, but I dont like the fact that, even though I already paid for the game, I still have to use money to get different boards and careers. Its cool to play, but it kind of gets boring when you play on the same game board every single time. I mean, if the game was free, I would understand that you have to pay for different boards; but the game ALREADY cost money, so its kind of a bummer. You can obviously tell that the creators are just trying to make money. I will keep playing, but I really hope that the people make the other game boards free. Just the fact that buying a house isn’t a stop space earns this game 1 star. Buying a house and the storybook on your life at the end of the game we’re the 2 best parts of the game. Now, there’s a good chance you won’t even land on the spaces to buy a house and they got the storybook on your life at the end of the game. If they made buying a house a stop space and added the storybook of your life back in, then I would change my review to 5 stars. The least that they could do is let us buy the old version of the game. There’s already a bunch of other versions that you can buy. That would also earn a 5 Star review. This was a game that I used six years ago to get the woman of my dreams next to me & play a game. We had a riot playing this game all while “hitting on each other” & flirting. I like the twist of the classic for sure because I actually get to be with a girl. Tonight is the first time playing a long time & with all the stars aligned correctly, I’m still playing this game with her. This coming Tuesday (July 3, 2018) I get to make her my wife. Thank you The Game of Life. You made my dreams come true! I enjoy the Game of Life, as it is highly addictive. I hope that a single round of the game could be much longer, allowing myself to become more eager and “on the edge of my seat” along the way. I shouldn’t be complaining, because some odds laughs escaped from my mouth as I saw I just won a round. It also nice to just sit, play the game & fantasize about if you’ll actually get that much money some day.😂 It’s a great game, but don’t forget to enjoy your own life as well! I have always loved playing the Board Game of Life. Now it's right at my fingertips! I would like for there to be less in app purchases. I understand the company has to make money, but I would also like the developers to consider those of us on a budget. There should be a way for us to earn tokens or something that can be used to trade in to buy the other worlds in the game if someone is on a tight budget. Otherwise, great game! Nice job. Just played for the first and last time - what the hell did I just play? Infinite spin loops for spin to win, stupid repeated action cards over and over, forced LONG animations that add nothing (looks like an undergrad computer science homework project). A few tips: 1. Stop air-dropping children from helicopters. Not good for the baby. 2. If two guys get married, and go into a hospital, and come out with a baby, the police should arrest them for stealing a baby. 3. Don’t make me have to stop and acknowledge every time there is a pay day. 4. Don’t use an arrow, which implies a swipe, when you need to tap. We loved the original port before the iOS upgrade, instead to keep playing I had to spend 3 bucks on this disaster- completely not worth it. 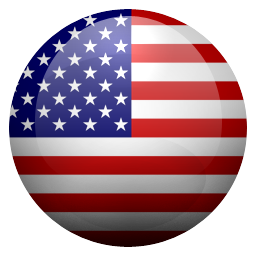 And by the way, I want to wish you all a very happy 4th of July, and I hope you all have a nice time with your families and friends, and that you should figure out soon how to make a normal game enjoyable by everyone. Thank you and good night. This is still a fun game to play, but it is also missing some key things from the old one. I don’t like the mini games and I think the DLC is way to expensive. Also I miss being able to have 6 players at once now you can only have 4. And buying a house you may make it through the whole game without buying a house because you have To hit the spaces on the board that are really spread out. But still is a fun game. Please update with the ability to connect locally or online with out Facebook offer us Email or user name logins. Would really enjoy this with our family device to device like many other games we play (ticket to ride, monopoly, exploding kittens, etc) but the Facebook requirement makes it an unusable game for us. Too bad, as we would love the worlds and extra paid features..... your loss. There are a few problems with this game - although i do like to play it, i have some suggestions and comments. First of all, the previous app for this game was so much better than this version. The players get different amounts of money and the board is so busy. Another thing is that sometimes the buttons take forever to work when i click them. The app also tends to lag and load for long periods of time. I hope you found this helpful but other then a fee things this is a pretty fun, addictive app! I absolutely love this game!!!! 😁😁😁😁 The happy 😊 background music, the mini games, the board, really I love ❤️ everything about this game. I read a few reviews about how some people grew up with the older version and miss it but to be honest I know it’s not exactly like the one ya’ll remember but it’s still a great game. Updated, but great 👍. 😃😃😃😃😃 I really think this is a great game and worth the money 💵. And I hope everyone has a great 👍 day and enjoys this game!!! 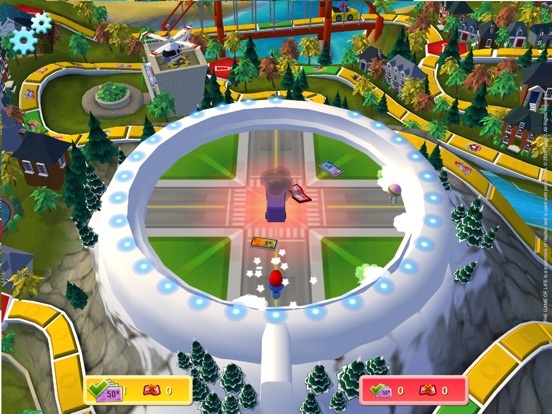 Very well planned out game of life with twists not found in the original board game or wii version. It's bright funny, and the changing themes keep it fresh. I do love the additional purchases that can be made to customize the game to your liking. However, if you choose not to, nothing is lost in game playing ability. That is key to any well made pay for upgrade game. Love the game and the talents that went into it, good job marmalade! I don’t know why everyone doesn’t like this game, but I think this game is going to be my favorite mobile game. I know that it isn’t like the original or anything but who cares honestly. Just because it’s not like the exact same as before doesn’t mean it isn’t a good game I also know that a lot of the things aren’t free, but you don’t need to pay additional money for extra things.